Congrats to quiddity for the winning entry and 50 duck prize. Thanks to everyone who entered and voted! Here are the final results of the Caption this drawing caption contest. "I call him Spruce Springsteen." We got our tree from Monsanto. X-mas Tree finds out snow was really cocaine. Oh Christma- IT'S ALIVE! RUN! I.. Saw My Tree Eat Up San--ta Claus! This makes the Grinch NOT want to steal Xmas. Has no-one noticed I'm Oscar from Seasame St.? How my grandpa imagines himself on Christmas. Your mom & Santa kissed under me last night.. The Great Deku Tree after too much eggnog. O CHRISTMAS TREE, O CHRISTMAS TREE!!!! That annoying novelty singing Christmas tree. Crazy, Vocal, and Immobile. A Treeple Threat. X-Mas Tree doesn't know that X-Mas is over. 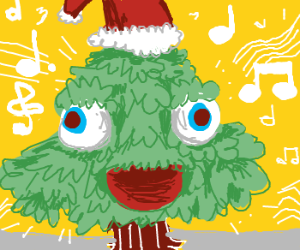 A happy Christmas tree w/ face is singing. The toy store REALLY went overboard this time. "Oh, Christmas Tree; oh, christmas tree..."
Music makes Christmas tree insane. Yule better watch out! Yule better not cry! Look at me! I am the singing Christmas tree! Santa secretly hides in christmas trees. Tacky Xmas Merch wants your soul. Trees have become too human! "Rocking around the xmas tree" sings the tree! Kermit the singing Xmas tree! An ill hairy Santa singing carols! Christmas tree with huge eyes singing songs. It just needed a radio, not anthropomorphism..
Christmas tree tripping in yellow-music land.